While we won’t dare utter the New Year’s ‘R’- word here, we will go ahead and share a few of our favorite ways to, ahem, start the year off on the right foot. Of course, it involves getting your move on outdoors. Check out these awesome winter events in Northern Michigan. Subscribe to Traverse, Northern Michigan’s Magazine for more Up North travel ideas. Spend a snowy afternoon on the cross-country ski trails in Sleeping Bear Dunes National Lakeshore, where you’ll break a sweat and find solace amid woods and a Lake Michigan backdrop. (Need ski rentals? Try Crystal River Outfitters in Glen Arbor.) Try one or more of the three Bay View trail loops totaling 8 miles—everyone’s happy with easy, intermediate and advanced options—and enjoy views of historic Olsen Farm and Miller Barn. For a groomed trail experience, check out nearby Sleeping Bear Heritage Trail, stretching more than 20 miles from Empire to Bohemian Road in Maple City. Trailheads are at Bar Lake Road, Pierce Stocking, Dune Climb, Glen Haven, Alligator Hill, Crystal River, Bay View and Port Oneida. Après-ski, stop by Joe’s Friendly Tavern in downtown Empire; try the famous housemade chili or Empire chicken wings featuring a dark cherry-flavored sauce. All this month, pair a snowshoe adventure with delicious wine and beer on Old Mission Peninsula. Bring your own snowshoes (or rent a pair for the day through Brick Wheels in Traverse City) for the annual Old Mission Snowshoe Wine & Brew outings. Your route starts at Jolly Pumpkin near Bowers Harbor, where you’ll board the TC Brew Bus and travel to Brys Estate Vineyard & Winery. You’ll trek through the snow, following a designated trail, across Old Mission Peninsula to Bowers Harbor Vineyards, then hike back to where you parked at the restaurant. Tickets cost $20/ person and include parking and shuttle service; five samples of wine at Brys; five samples of wine and/or hard cider at Bowers Harbor Vineyards (warm up around the outdoor fire pit); and five samples of beer or spirits at the Mission Table tasting room in front of Jolly Pumpkin. Go on an enchanted snowshoe expedition this winter, culminating with a gourmet three-course dinner. 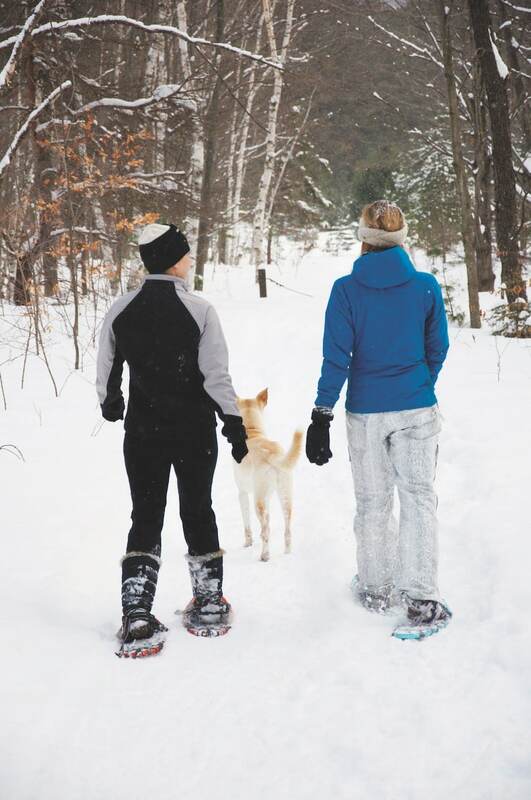 The guided hikes (February 9 and March 2) start at the Country Club of Boyne in Harbor Springs and take guests on the resort’s best trails. Upon return, snowshoers will enjoy an outdoor fire, hot chocolate, and s’mores. Dinner will be served at 7 p.m. Tickets are $30 per person (does not include tax, gratuities, or cost of rentals if needed) and are available at MyNorthTickets.com. Leave the hard work to the canines while taking in the snowy landscape at Treetops Resort in Gaylord. This exhilarating ride through the trails on the Jones Masterpiece Golf Course is led by a team of dogs training for the ultimate sled-dog race, Alaska’s Iditarod. Each ride is two miles long and can be enjoyed individually or with a child. Reservations are suggested; rides are scheduled throughout the day and are set for January 14 and 15, and also in February on the 10th, 11th, 24th and 25th ($50/person, $20 for an additional person in sled). Not quite up for a ride but would like to meet the dogs? Stop by the resort January 13, February 10 or February 24 for this event. Stay for the weekend in a Treetops chalet, cottage or lodge room. Call for special winter package pricing—866.348.5249. Cheer Fest (formerly Party in Your Parka) at the Leland Lodge offers ice skating, sledding, bounce houses for kids, food and drink specials, prize giveaways, special lodging rates and a whole lot more. Enjoy live music from Jim Hawley (2–5 p.m.) and The Broom Closet boys (6–10 p.m.). Adults are invited to The Wine Cellar for a special Valentine Vodka Bloody Mary Bar and other specialty drinks. Tickets are $10 for adults ages 13 and up, $5 for children 4–12 and free for children 3 and under. The party starts at 2 p.m. and goes until you’re frozen. Traverse travel editor Heather Johnson Durocher writes from Traverse City. travel@traversemagazine.com.